The elegant beauty of a silk orchid suspended in gel in a sleek glass container with a tealight at the top is sure to warm the hearts of your guests! 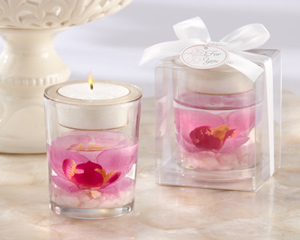 This pretty orchid candle favor is perfect for any event in style - as Hawaiian theme wedding favors, Sweet 16 favors, bridal shower favors and more! 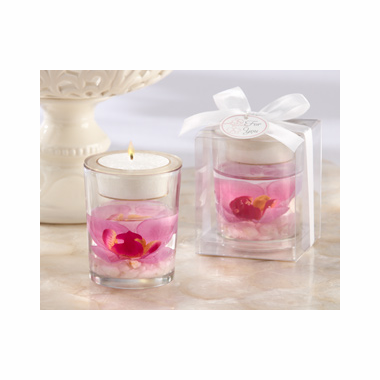 Each beautiful silk orchid is a soft purple/pink color and floats in clear gel beneath the tealight insert area (tea candle is included) and is all set in a clear glass container. It measures approx. 2.75" in height and 2.25" in diameter. It comes packaged in a clear box for presentation viewing and finished with a white satin ribbon and bow with a white tag with purple accents that says "For You". The box is approx. 2.75"H x 2.30"W x 2.30"